The Lumber Inspectors' Union, B .C . Division, was incorporated under the Societies Act on March 7th, 1945. On April 11th, 1949, upon the recommendation of its executive officers, members agreed to transfer to the Canadian Congress of Labour (CCL) and become the Lumber Inspectors' Union, B .C . Division, Local 1, CCL. Following the receipt of its charter from the CCL on May 5th, 1949, this title was officially certified. In 1956, the Union became a charter local of the new Canadian Labour Congress (CLC) . On May 1st, 1961, it joined the International Woodworkers of America (IWA) to become the sole member organization of Local 1-288, which was a local chapter of IWA's Western Canadian Regional Council No . 1 . 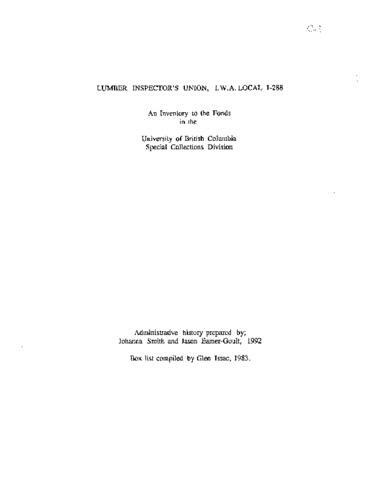 The Lumber Inspectors' Union's mandated objectives of 1945 were to organize and unionize lumber inspectors in British Columbia , to promote lumber inspectors within the industry, to increase their knowledge and efficiency, to create and distribute opportunities in lumber inspection, to further the enactment of legislation which would benefit the Union members, and to secure compensation and pay comparable to that of similarly skilled workmen . As well, the Union was to promote cooperation and friendship among its members, to encourage members and their families to achieve a high level of citizenship, and to make provisions for misfortune or death benefits for the members and/or their dependents . These last three objectives were expunged in the 1949 Constitution . In the 1961 Constitution, only the first four objectives of the Societies Act remained, while the responsibility for the payment of benefits was jointly assumed by the Welfare Fund (1951), the Lumber Inspectors' Mutual Benefit Association (1953), the Lumber Inspectors' Credit Union (1955), and the Benevolent Society (1955). In reality, the functions the Union carried out were supporting on the job concerns (including safety, working conditions and promoting the availability of job positions), assuring general job satisfaction (through negotiations, arbitrations, grievances, and conciliations), and maintaining the members' financial security (by administering benevolent funds, pensions, and workers' compensation) . The Union's primary responsibility was to its members, although it was subordinate to the CLC and later the IWA . The Union was organized on a province-wide basis, with sub-locals in Victoria, Duncan, Nanaimo, Port Alberni, 100 Mile House, Haney-Mission, Tahsis, and Vancouver . Its records were kept in the Vancouver sub-local's office . The Union's membership's primary employer was the Pacific Lumber Inspection Bureau (PLIB), although any inspector in British Columbia, regardless of his or her employer , could be a member of the Union . In 1980, the Lumber Inspectors' Union was disbanded and its members transferred to other IWA locals . The Lumber Inspectors' Union's records remained in the possession of the IWA until they were transferred to UBC's Special Collections in 1982. The Lumber Inspectors' Union fonds' consists of records necessary for the union to carry out its everyday operations, such as office files, minutes, financial records, correspondence etc. It also includes papers directly relating to the position of the financial secretary. Record types include correspondence, minutes of meetings, agreements, booklets, policies, reports, constitutions, information on other unions , booklets, financial and operating statements, ledgers, particulars on union members, manuals, arbitration cases, and reference material. The bulk of the records fall in the active period of the Union, which was between 1945 and 1980 ; a few records dealing with winding up the Union were also created in 1981 . The fonds has nine series: Operational files ; Minute books ; Financial records ; Financial ledgers ; Application, dues payment, and transfer records ; Arbitration cases reference files ; Register of attendance at meetings ; General information binder; and General reference material . The fonds also contains the Financial Secretary's sous-fonds, which has five series. Materials are in generally very good condition. The fonds was donated to UBC Special Collections by Clay Perry, Legislative Director of the International Woodworkers of America (IWA) Western Canadian Regional Council No. 1 in December 1982. The fonds was acquired by Rare Books and Special Collections in 1982. Roughly 7 metres of records were donated. At this time the archivists noted that the records required little arrangement, as they already had an identifiable order. A partially completed file list was created in 1983 for the Operational files series. An administrative history was completed in 1992 by staff at Rare Books and Special Collections, and is available in this database as a PDF document. In August of 2016, it was discovered that the file list in the original finding aid was only partially complete; in the fall of 2017 an archivist from Rare Books and Special Collections undertook the processing of the remaining records in the fonds. The archivist updated the description in this database to reflect the complete intellectual order of the fonds in order to increase ease of use by researchers. The archivist maintained the original order of the records throughout this process. There are no access restrictions on the fonds. The first arrangement and description of the Lumber Inspector's Union records occurred in 1983 and the finding aid to reflect this arrangement is available as a PDF. In the fall of 2017 further work on the fonds was completed resulting in the file list accessible in this database. It is recommended to access both the finding aid as PDF and the online file list when consulting records within the fonds. The first processing of the Lumber Inspectors' Union records was completed in 1983 by RBSC staff. The description was partially completed at this time, and was then updated in 1992. In 2017 Claire Williams updated the finding aid accessible on this database.